The weather isn’t great and the pubs close too early and the food is often better in other cities and yet London is still one of the capitals of the world and is packed with so much history. 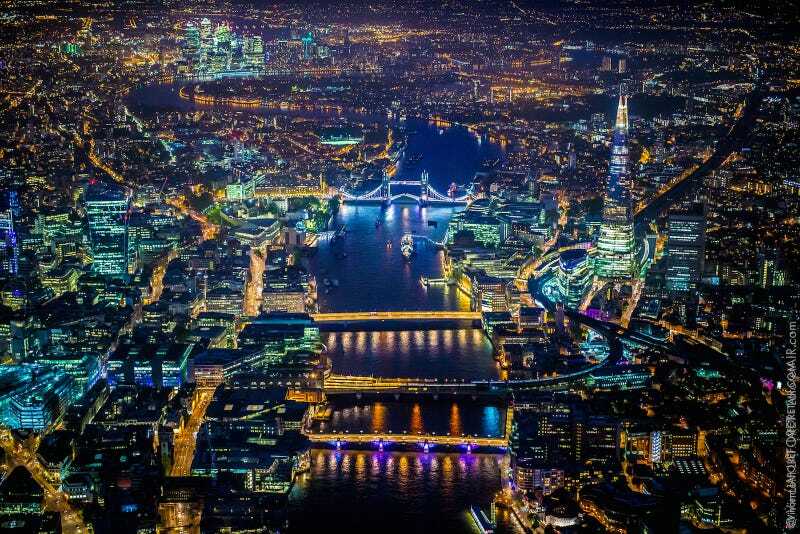 Photographer Vincent LaForet took these amazing aerial shots of London and seeing the city overhead like this reminds you why that is. The buildings may be old and the streets may be confusing when you’re down low but boy, it looks great from above. Click on the magnifying glass to zoom and see these images up close at full screen because the detail is absolutely phenomenal. It’s the only way to do them justice. Vincent Laforet is a director, photographer, and a pioneer in tilt-shift, aerial photography, and in HD DSLR cameras for shooting film. He won the 2002 Pulitzer Prize for Feature Photography for his images of Afghanistan and Pakistan’s conflicts after 9/11, plus three prizes at the 2010 Cannes Lions International Advertising Festival. Vanity Fair, The New York Times Magazine, National Geographic, Sports Illustrated, Time, Newsweek, Life and many other national and international publications have commissioned his service. Follow him on his blog, Twitter, Facebook, Storehouse, and Instagram. You can buy his book Visual Stories: Behind the Lens with Vicent Laforet here.